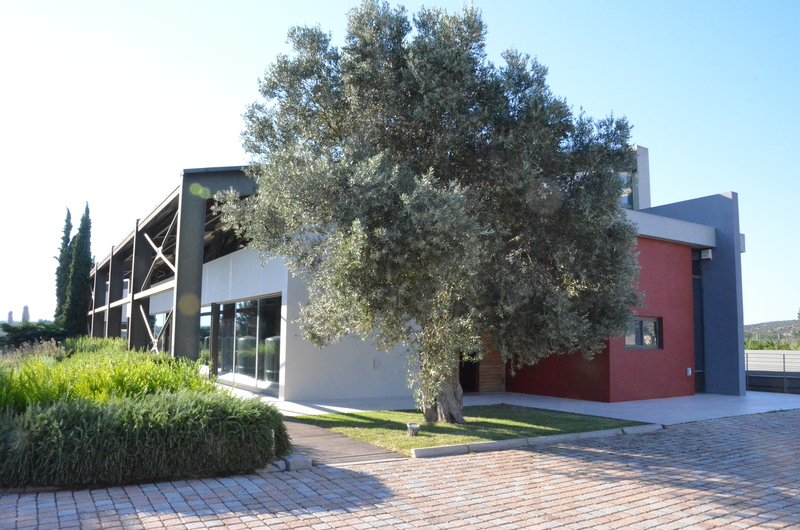 Located a 20-minute drive southeast of Athens International Airport, the Papagiannakos Winery sits on the northwestern edge of Porto Rafti in Markopoulo. Shoebox-shaped with a sloping roof and prominent girders that, in profile, look like a giant Π (pi, the first letter of the family name), the current structure was built in the mid-2000s. It is, in a word, gorgeous: clean and modern in design, integrated into the surroundings, eco-friendly and featuring extensive use of local materials, in particular stones. The equipment is state of the art, the compact barrel cellar houses Allier and Nevers oak casks. A glass wall under a large overhang faces south providing ample daylight while, on the north side, a row of clerestory windows runs above the tall stone wall ensuring good airflow and an escape route for warm air. At the far (west) end of the building are found, on the lower level, a large tasting room and, on the upper level, a beautiful, high-ceilinged event space with a sweeping view over the valley to the ridge separating the region from Athens, with the airport’s control tower just visible over the intervening hills. Carefully chosen artwork adorns the walls. In short, it’s a feel good place. 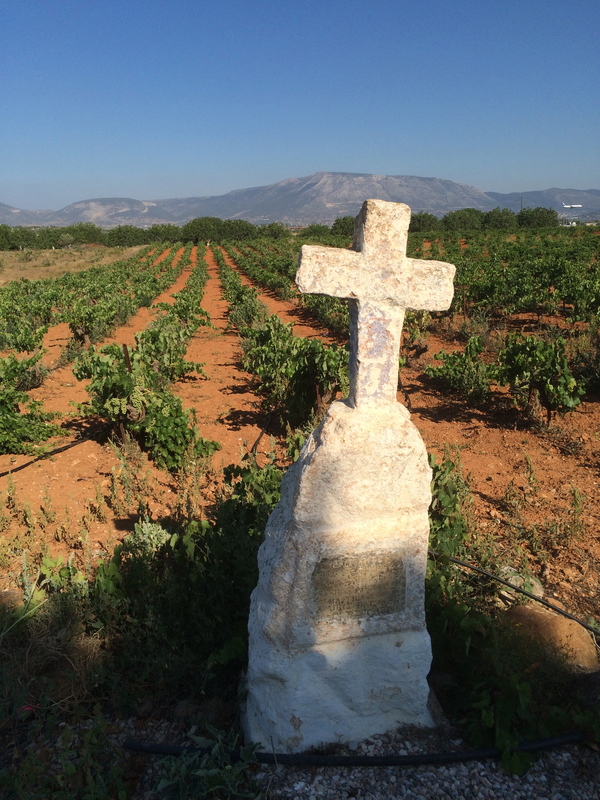 The Papagiannakos family has been growing grapes and making wine in Markopoulo since 1919. In the 1960s, the second generation upgraded the winery and improved the quality of its output. The current, third-generation owner-winemaker, Vassilis, took over in 1992, and almost immediately began the process of bringing the winery into the 21st century. It may be a conceit but I’ve often found winemakers to resemble the wines they make. In any case, it’s true for Vassilis: classy yet down-to-earth, generous yet reserved, rooted in the past yet forward-looking, attached to a place yet also aware of the world. Speaking about his wines, he rightly said “they don’t shout,” but he could equally have been talking about himself (or his winery’s handsome labels, for that matter). Papagiannakos has several vineyards, some around the winery and others – including ones under contract – scattered throughout the environs. Though the soil varies from parcel to parcel, it is generally rocky and infertile over a limestone base. The area receives no rain to speak of from May or June through October, so the vines are grown in low bushes; rot isn’t a problem here, in contrast to, say, the Peleponnese, where grape vines are usually trained on wires. The dry, breezy conditions also mean there is no need for insecticides or fungicides. On the other hand, irrigation (drip to conserve water) is a necessity, especially for young vines. After a tour of the building, we gathered in the event room for a technical tasting with Vassilis and members of his family, including his children, affable, knowledgeable and articulate young adults who will eventually take the reins from their father. You’ll find my tasting notes after the jump. For details about where we stayed, where and what we ate and what we saw, including some of Papagiannakos’s vineyards, see the Day One report on carswelliana. 100% Assyrtiko from unirrigated vines. Manually harvested. Given a short maceration on the skins. Fermented with selected yeasts at cool temperatures (16-18°C). Sees only stainless steel until bottling. Matured in the bottle one year before release. 13.4% ABV. Typical production: 4,000-5,000 bottles. Straw with green glints. Lovely nose of minerals, green grape and subtle notes of lemon-lime, fresh herbs and alcohol. Mouth-filling. More minerally than fruity. Very dry though with a hint of sweetness in the background. Smooth and sleek but with a welcome acidic/alcoholic bite. Assyrtiko often seems insipid outside of Santorini but not here. Wine-making as for the 2015. Officially 12.5% ABV though actually more like 13%. Slightly more golden. Very similar to the 2015 though slightly more evolved, especially on the nose, which sounds a nutty, almost woody note. 100% Malagousia from young vines. Fermented (with selected yeasts) and matured in temperature-controlled stainless steel tanks. 12.5% ABV. Pale green-yellow. Floral and fruity nose. Smooth and fluent in the mouth. Fruity but not too. Dry though the upfront fruit makes a sweet impression. Long finish with a welcome mineral/saline current and a hint of fresh herbs. 100% Savatiano from unirrigated 50-year-old vines. Manually harvested. Fermented (with selected yeasts) in temperature-controlled (16-18°C) stainless steel tanks. Matured on the lees for three months. Reducing sugar: 2.0 g/l. 12.5% ABV. Available at the SAQ ($17.45, 11097451). Quebec agent: oenopole. Nose of lemon curd, key lime pie and minerals. Less acidic than the Assyrtiko but with a similar underlying stoniness. Lemon fresh with a lingering bitter note on an impressively clean finish. Straightforward and to the point, though as the following bottles showed, that’s partly due to its young age. Wine-making as for the 2015. 12.5% ABV. Lovely nose: the minerals are more chalk-like than the 2015’s and there’s some peach and a floral note. Smoother, drier and creamier than the 2015, the acidity crisp. A hint of butter appears on the long finish. The bottle has κτημα (estate) written in a brush typeface on the front label of this premium bottling. Price runs about double that of the regular bottling. 100% Savatiano. The wine-making differs from the regular Savatiano though, beyond admitting that some skin contact and no oak are involved, details were not provided. 12.5% ABV. Deeper and darker to the eye. Complex nose with pronounced sesame and petrol notes. Umami-rich mouth. Balanced, layered and complex with minerals galore and very present acidity. A straw note perfumes the long finish. Impressive. Similar in colour to the 2012. Even lovelier nose: multifaceted with petrol and burned mineral hints, turning fresh and meadowy after a few minutes in the glass. Fresh in the mouth, too, though also showing a faint nuttiness. Clean and bracing. Built around a core of pure fruit with minerals emerging on the long, layered finish. Golden to the eye, like a Sauternes with some age on it. Complex nose with crème brûlée and dried apricot overtones. Clean and elegant on the palate, the acidity glowing, the fruit giving way to tertiary flavours. So dry, so long, so delicious. Who knew Savatiano had such aging potential? Really impressive. 100% Savatiano. Fermented and matured in new oak. 12.5% ABV. On the nose, the oak is discreet. On the palate, the wine is refined, even elegant. Pure fruit, animating acidity and good length. On the one hand, the oak seems a bit of a distraction; on the other hand, the final result isn’t unconvincing. Would be interesting to taste this again in a few years. 100% Savatiano, which is considered the best grape for retsina. Manually harvested. Fermented (with selected yeasts) in temperature-controlled (16-18°C) stainless steel tanks. Aleppo pine resin is added during alcoholic fermentation (0.5 kg of resin per 100 litres of wine). 12% ABV. A nose very similar to the regular Savatiano with a whiff of pine needles and earthy minerals. Surprisingly fresh and civilized in the mouth, the pine a component, a subtle part of a bigger, harmonious whole. The fruit and minerals of the regular bottling are present here too. The kind of retsina that can make a believer out of you. Accompanies tzatziki, taramasalata and other meze as to the manner born. Would love to see this at the SAQ. This is the first vintage of the wine. The name alludes to pomegranate. A blend of Cabernet Sauvignon (70%) and Agiorgitko (30%). Made using the saignée method. Fermented in stainless steel vats at 18°C. 12.5% ABV. Medium-pink with an orangeish cast and pale rose glints. Red berries, sweet spice, faint minerals and a floral note. Juicy but very dry with sleek acidity, a prominent mineral streak and good length. A gastronomic rosé with real presence. Agiorgitiko (70%) and Cabernet Sauvignon (30%) from old, dry-farmed vines rooted in clay soil. The vineyard is located at an elevation of 300 m in the central Peleponnese. Fermented with selected yeasts. Matured in oak barrels for six months and in bottle for another six month. 12.5% ABV. Attractive nose of cassis, blueberry and integrated oak. Medium-bodied and smooth, with fine tannins, good acidity and non-jammy fruit. Fairly long. 100% Cabernet Sauvignon from young dry-farmed vines rooted in limestone soil. The north-facing vineyard is located at an elevation of 110 m in southeast Attica. 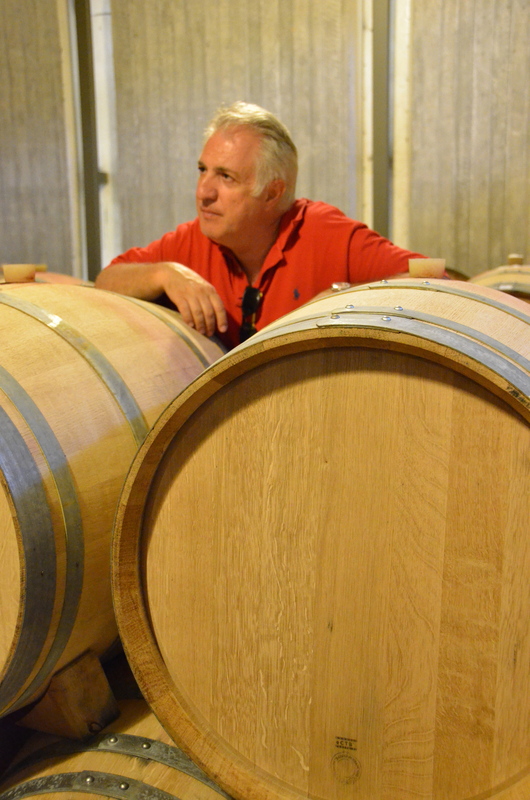 The wine is fermented in stainless steel tanks and matured in French oak barrels for 20 months (not the usual 14 months) because the Euro crisis meant the estate was unable to buy bottles. 12.5% ABV. Red fruit, in particular cassis, overtoned with herbs, menthol, tar and oak. Medium-bodied and fundamentally smooth. The ripe but not heavy fruit is structured by soft acidity and round tannins that show some grit on the finish. Young vines so not much depth. It’s got length though. 100% Merlot from from dry-farmed vines rooted in limestone soil. The north-facing vineyard is located at an altitude of 90 m in southeast Attica. Extended maceration and fermentation with selected yeasts. Matured in French oak barrels for 14 months. 13% ABV. Cherry cordial, spice and oak. Not a bomb but the most internationally styled wine in the lineup. Soft tannins, bright acidity. Vanilla and mocha come out on the finish. The third vintage of this wine. 100% Malagousia from dry-farmed vines rooted in limestone soil. The north-facing vineyard is located at an elevation of 100 metres in southeast Attica. An amount of must equivalent to 40% of the final wine is boiled down to concentrate it and the sugars it contains. Successive doses of fermenting unboiled must are then added. 13% ABV. Residual sugar is quoted as 120 g/l. The elegant, svelte bottle holds 500 ml. Golden to the eye. Beguiling nose redolent of green grape, peach/apricot and a touch of light honey. Sweet but not saccharine or cloying. The pineappley fruit tastes pure, fresh, uncooked. Bright acidity balances the sugar and lightens the unctuous texture. Long. A charmer with real presence. This is essentially the Melias but has been barrel-aged for three years. Only one barrel (350 bottles) was made. Not for sale, unfortunately. 13% ABV. Bronze to the Melias’s gold. Rich nose redolent of brown sugar and raisins. Less sweet than the Melias, again with balancing acidity. Complex flavours, a certain depth and a very long finish. As delicious as it is unusual. And given the quantities made, a privilege to taste.